NY: Columbia University Press, 1989. cloth, hardcover in dust jacket., only negligible signs of use. no flaws - clean, no writing/markings, tightly bound. 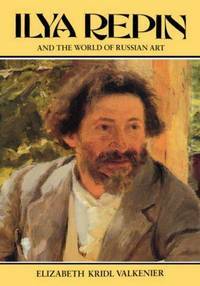 ; xvi-248pp., 8 color plates, 65 b/w illustrations., detailed chronological examination of the career of ilya repin, which stradled major events in russian history.. First Edition/First Printing. Hard Cover. Near Fine/Near Fine. 4to - over 9¾" - 12" tall. Keywords: Russian Art. ; Russian Painting. ; Ilya Repin.